I love food accoutrements especially the raw veggies, sauces, fresh herbs and lime that come with soups like Posole and Pho. The smell alone makes me swoon – cilantro, lime, jalapenos – but then to be able to add the various items according to my likes and then make a perfect bowl of comforting soup, forget about it. Lots of “mmmm”ing ensues. 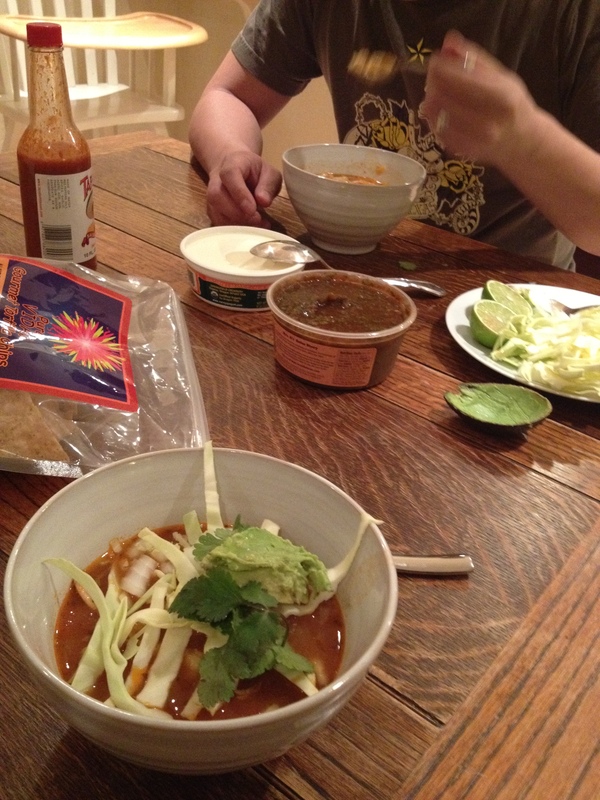 Here’s a recipe for posole that we really liked. I can’t remember the source where this adaptation came from but the inspiration is an undying quest to recreate “Visions of Mexico” with L & J and our meals at La Chata. Cook onion in olive oil until translucent. Add garlic, tomato paste, and herbs and cook until paste turns a bit darker. Add chicken (skin removed) and broth. Bring to a simmer and cook for 30 mins. Pull out breast and shred. Add it back into soup with a drained can of the hominy. Salt and Pepper and Cumin to taste. Simmer for 30 mins. Serve with shredded cabbage, lemon, avocado, cilantro, diced white onion, sliced radishes and tortilla strips. 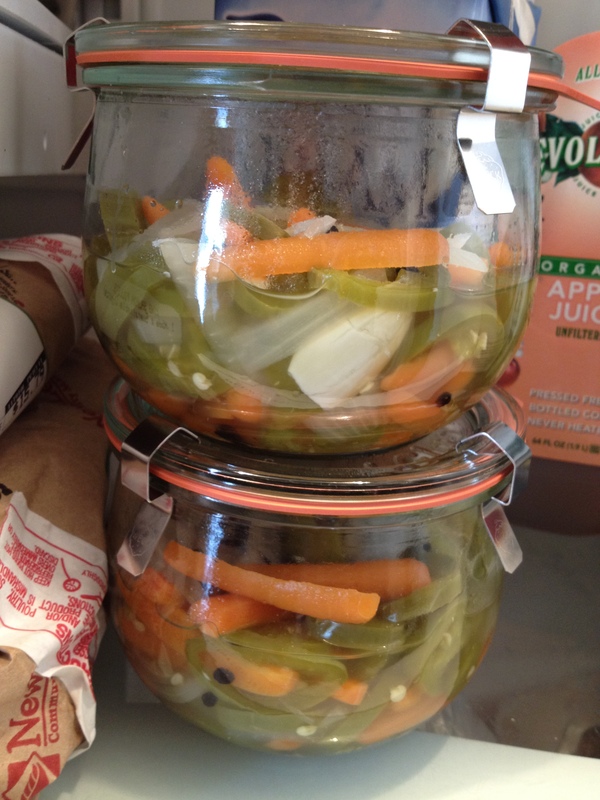 Pickled jalapenos, carrots and onions used to be a food item I marveled at while my second dad devoured them. I remember thinking Yuck (which is a typical pre-teen’s response to anything their parents did that was remotely different). I can remember the vinegary smell and hearing the crunch of the carrots as he munched away at them as if they were a side dish like refried beans or rice to his tacos. Put all the ingredients in a saucepan and bring to a boil over medium high heat. Continue boiling until the jalapenos have gone from grass green to a light olive green (~2-3 mins). Pour ingredients into your canning jars (2 jars) and cover. Let stand on the counter until cool. Stores in the refrigerator in a sealed jar for weeks (though mine don’t last a week). So when I got pregnant, I was a bit concerned about losing my identity. Becoming someone’s Mom seemed so encompassing. I couldn’t imagine how I was still going to be the me before baby, after baby. So I did what I always do when things become a bit overwhelming, I made a list. This list consists of all the things I wanted to do then that I might not remember post baby. Well, here we are. Ne is now 16 months and amazingly lots has been crossed of the Me list. It helps that I have taken some time off work too. One of the items on the Me list was to start a blog to archive all my food antics like recipes (successes and failures), canning, trades, market and farm adventures, basically documenting all the Scrumptious Bits I come across. Here’s my first entry and it feels great just to make the effort. I’m hoping to make regular contributions and that it becomes interesting for ya’ll.